Tom Perez's endorsement of the New York governor — who's facing a primary challenge from actress Cynthia Nixon — broke with the party vice chair and infuriated the left. WASHINGTON — Democratic National Committee Chairman Tom Perez endorsed New York Gov. Andrew Cuomo's re-election Thursday, angering some on the left who say the party leader is violating his own pledge to stay out of primaries. Perez's highly unusual involvement caught even Rep. Keith Ellison, D-Minn., the DNC deputy chairman, by surprise. "The Democratic Party should not intervene in the primary process," Ellison said through a spokesperson. "It is our role to be fair to all contestants and let the voters decide." Perez addressed the convention of the New York State Democratic Party, which is effectively controlled by Cuomo, and declared he was "proud to endorse" Cuomo and his lieutenant governor, Kathy Hochul. "You've been delivering results and you've been delivering results that have made people's lives better. That's why Andrew Cuomo and Kathy Hochul are charter members of the accomplishments wing of the Democratic Party, and that's why I'm proud to endorse them," Perez said. Cuomo is seeking for a third term and facing a spirited primary challenge from actress Cynthia Nixon, who is running to his left. 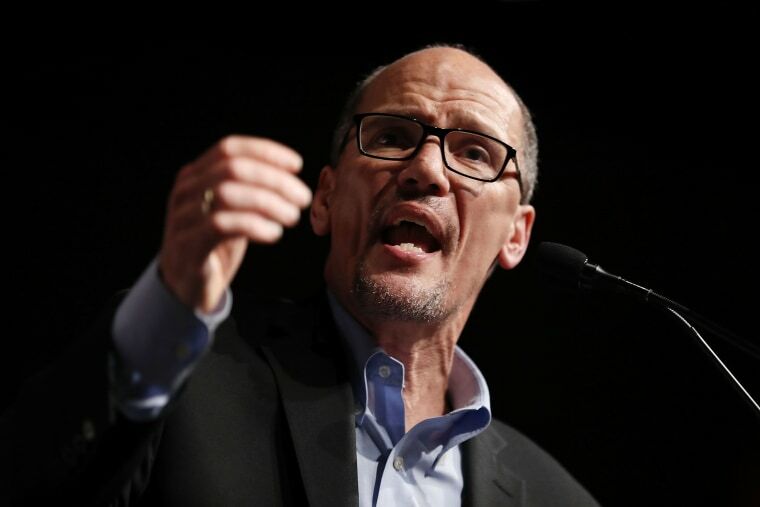 Party chairmen typically play the neutral arbiter role in primaries, and Perez himself has repeatedly stressed the importance of staying out of Democratic contests. He took over the party last year pledging to restore trust after controversy about DNC involvement in the 2016 presidential nominating contest. A DNC official, who would only comment on background, told NBC News that no DNC resources would be used to support Cuomo's primary campaign or to attack any Democrats running. "Tom has a decades-long relationship with both Gov. Cuomo and Lt. Gov. Hochul. From knocking on doors for the governor's dad in Buffalo to their work together on fair housing in the Clinton administration to their collaborative work during Tom's tenure as labor secretary, the two have many shared accomplishments and developed a strong personal bond," the official said. Still, Perez' forceful endorsement is unusual, even though incumbents often get the automatic endorsements of other party groups, like the campaign arms of Democratic governors or House members. On Friday, for instance, Perez told NBC News that the DNC had been "scrupulously neutral" in this weeks' Georgia's Democratic gubernatorial primary "because we think the voters should decide that." His involvement in the New York race drew criticism from the left. "The entire reason we hold primaries is because voters should decide who's on the ballot, and not party bosses," said Karthik Ganapathy, a spokesperson for MoveOn. "It's wrong for those in charge of official party infrastructure to put their thumb on the scales and try to influence the outcome of elections before the primary voters who form the party's grassroots base have had a chance to cast their ballots." Perez was one just one of several bold-name Democrats who threw their support behind Cuomo at the convention, including former presidential nominee Hillary Clinton and former Vice President Joe Biden. If Cuomo decides to run for president in 2020, the issue may come up again, since the DNC is responsible for referring the primary. Nixon’s campaign responded by slamming Cuomo. "Cuomo can cloak himself in all the endorsements he wants, but it won't hide that fact that he's effectively governed as a Republican for eight years," said Lauren Hitt, a spokeswoman for Nixon’s campaign. "We're grateful for Chairman Perez's support and look forward to working with him to elect more Democrats at every level in November," said Lis Smith, a Cuomo spokesperson.